children without food, packed gifts and written notes to veterans who have been injured in war, and brought presents to women and children at a local shelter who’ve experienced domestic violence. All of these actions have led to heartfelt conversations with our kids. They’ve asked hard questions and we’ve tried to answer as honestly as possible. Although we never wish to scare our children, we want them to know the reality of what is happening in the world. We want them to know that as Christians we will help because we believe that God is the greatest comfort, the greatest healer, the greatest LOVE the world will ever know. And if they see that their parents believe that our kind acts can extend God’s grace to the brokenness of this world, maybe they’ll believe that God can heal the brokenness inside of them. I’ve realized my children don’t need me to answer all their questions or solve all their problems, they just need to know that we believe in a God who will never leave them or forsake them. Even when they mess up or are angry or hurt. Our God meets us right in the middle of our own messes, and if my kids see this in a tangible way when they are young, then maybe they will grow up sure of this knowledge, this truth--that God can love them through any challenge or pain or disappointment. We want our kids' faith, compassion, kindness, and love to be real because the world has real problems that need us to be the literal hands and feet of Jesus, willing to go. Willing to help. And serve. And love. I pray that my kids learn to not turn away from the pain of the world but to lean in, to look at what needs to be done and believe it’s within their power to help. These kind acts do so much more than just teach my kids to not be so materialistic or to think of others above themselves. Hopefully, they learn that with God’s help they are empowered to do something about what is happening around them. I don’t want to raise kids who complain, wonder what the world’s coming to, or gripe about how awful things have gotten. I want to raise kids who see needs and are compelled to do something about it. Hopefully they will do just that because they had parents who believed that their actions mattered, and because they see how God has gifted them to make the world a better place. But this isn’t just for our kids. These things I’ve just written, these hopes and prayers that I have for my kids? I want to believe them for myself, too. I want to look at the world and all its concerns with hope, not helplessness. Compassion, not indifference. Love, instead of hate or even just ambivalence. I pray these things for my children, for myself, for all of us. 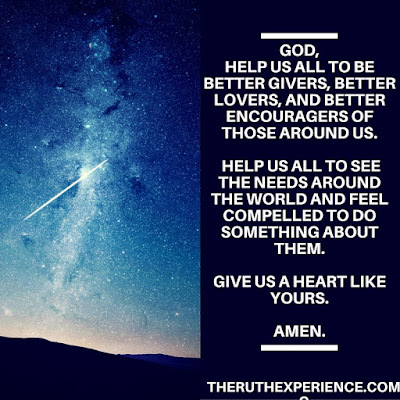 God, help us all to be better givers, better lovers, and better encouragers of those around us. 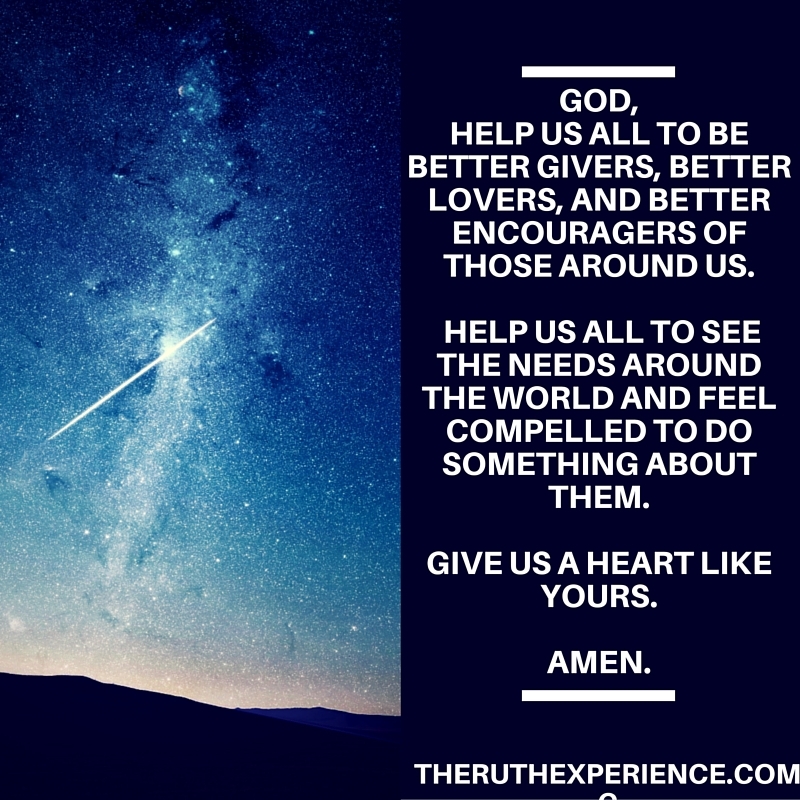 Help us all to see the needs around the world and feel compelled to do something about them. Give us a heart like yours. Amen.